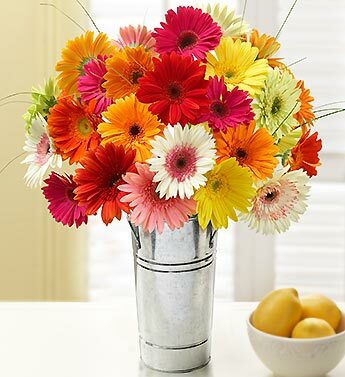 With their long, colorful petals bursting like rays of sunlight, daisies are the perfect flowers for delivering warm smiles to those we love most. But this beautiful blossom isn’t just an American favorite; its bright and cheery spirit is cherished by people all around the globe. After all, daisies are members of the biggest plant family in the world—vascular plants, which make up 10 percent of all flowers on Earth—and grow on every continent except Antarctica. Want to find out why this happy little flower has captured so many hearts? Here’s everything you need to know about daisies! It’s believed that the daisy gets its name from the Old English phrase “daes eage,” or “day’s eye,” because of the way the flower blossoms at the first sign of dawn. Daisies have been around since 2,200 B.C., when the ancient Egyptians grew them in their gardens and used them as herbal medicine. The daisy family, scientifically known as Compositae, was officially classified in 1792 by German botanist Paul Dietrich Giseke. The Gerbera, the most well-known daisy variety in the modern world, was discovered in 1884 in South Africa by a Scottish man named Robert Jameson. In 1890, it was brought to England, where breeders grew a variety of Gerberas that boasted brighter colors and sturdier quality. The popularity of Gerberas slowly spread to the Netherlands, which became one of the biggest Gerbera daisy distributors in the world—a title it still holds today. Gerbera Daisy: The fifth most popular flower in the world, the Gerbera comes in a full rainbow of colors, including pink, orange, yellow and red. Its vibrant petals make it the flower of choice for celebrating every happy occasion, from birthdays to weddings. Shasta Daisy: With its soft, pearly white petals radiating from a golden center, the Shasta daisy is a timeless classic. It’s not only one of the largest daisies, but also one of the easiest to grow and care for. Plus, you can enjoy its hearty blooms season after season. Rudbeckia: Also known as the Black-Eyed Susan, the Rudbeckia has fiery yellow petals and a deep brown center—almost like a miniature sunflower. Their reputation as low-maintenance and long-lasting blooms makes them a favorite of flower-lovers everywhere. The sweet simplicity and genuine beauty of the daisy have made the flower an international emblem of innocence and purity. Its fresh, crisp appearance has come to symbolize new beginnings, and its bright, spirit-lifting colors are known to spread happiness like wildfire. It’s for all of these reasons that daisies make the perfect gifts and decorations for celebrating all of life’s biggest milestone events. The daisy is two flowers in one: The large outer petals make up one flower, and the cluster of tiny petals that form the center “eye” make up another. Daisy leaves are consumable: High in vitamin C, the leaves of a daisy are actually very closely related to artichoke. Daisies can be turned into medicine: Some health benefits of daisies include relieving indigestion, soothing coughs, slowing bleeding and easing back pain.